Cowboys WR Signings Aren’t About Dez, Could They Draft Another at 19? What started off as a boring Dallas Cowboys offseason sure has gotten a bit interesting in the last few days, especially for the wide receiver position. Ever since the 2017 season ended quite before it should have, Dez Bryant and the future of the receiving corps in Dallas has been one of the most discussed topics among Cowboys' fans. With the recent free agent signings, inevitably questions arise. Specifically when talking about the former Jaguar Allen Hurns, one naturally wonders whether or not it will affect Bryant's position on the team. It certainly doesn't appear to be the case, judging by comments from the team's front office, who appear to be convinced that Dez will be throwing up the X while wearing the Star on his helmet next season. However, a talk between the Dallas Cowboys franchise leader in touchdown catches and the team still needs to take place. Dez will have a huge cap hit of $16.5M in 2018 and with him failing to justify his salary over the last three years, that's something that should probably change. Although we know about the mutual love that exists between the franchise and the player, it's a very intriguing story. Allen Hurns is now on the team, the Cowboys are hosting multiple wide receiver Draft prospects and well, Bryant did say "Hell no" when asked about a potential pay cut back in December. Sure, it looks like Dez is staying, but Cowboys Nation should really be keeping an eye out for the outcomes of the much-awaited meeting. "I certainly have not had a thought about talking with him that did not anticipate him being with us." Jerry Jones on future meeting with Dez Bryant. Last week, I wrote about how the Cowboys nailed the wide receiver position by signing Allen Hurns and (seemingly) deciding to keep Dez on the roster. With both on the field, your offense is clearly improved. However, replacing Bryant with Hurns undoubtedly downgrades the team's passing game. 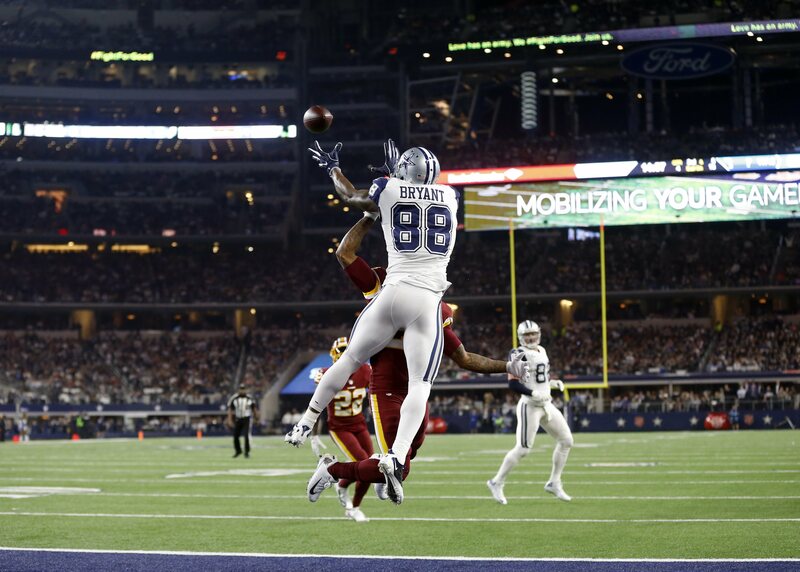 Say the Cowboys are indeed keeping Dez... the WR room will be loaded. Terrance Williams' and even Cole Beasley's jobs in Dallas will be put at doubt. Both could be valuable trade assets. Should the Cowboys consider taking another wide receiver in the first round in a class full of quality guys at the position? Before getting Allen Hurns aboard, WR had to be among the team's top needs. However, now there are other positions that feel more urgent, such as linebacker, defensive tackle and even left guard (although I wouldn't be a fan of taking a linemen at 19). Dallas should still be looking for a good receiver in the Draft, but a Day 1 pick shouldn't be worth the investment. There are many good prospects who'll be available in later rounds, and now that it isn't a pressing need, the Cowboys should be fine with waiting. Allen Hurns is only 26 years old and with an inexpensive two-year deal in Dallas, he looks like the answer right now at WR. If Dez has yet another down year, Hurns could be the heir to Bryant's role on the offense in 2019. The Cowboys have a lot of money invested in receivers, giving the WR room the "most intriguing position" title on the team for the rest of the offseason. With Dak Prescott going into the third year of his contract, things better work out for a team that must take advantage of its young fourth-round quarterback. Tell me what you think about "Cowboys WR Signings Aren’t About Dez, Could They Draft Another at 19?" in the comments below, or tweet me @MauNFL and let’s talk football! If you like football and are looking for a Dallas Cowboys show in Spanish, don’t miss my weekly Facebook Live! show, Primero Cowboys! What’s the Dallas Cowboys Plan at the WR Position?